Well, nothing except that many of the Netflix projects have a high barrier to entry because they're geared toward deployment on Amazon's EC2 platform and require a great deal of configuration and management in their raw form. But thanks to the Spring Framework, it's easy to deploy Netflix OSS on Heroku while adhering to the principles of the Twelve Factor app and benefiting from Heroku’s first-class developer experience. In this article, you'll learn how to deploy Netflix's Eureka server to Heroku and connect your own microservice clients to it. The Netflix projects are centered around the concept of microservices, which describe a strategy for decomposing a large project into smaller, more manageable pieces. Although decomposing big projects into smaller pieces is an age-old process, the recent microservices movement captures a number of best practices about how to do it well. For more discussion on microservices, see our recent blog post on Why Microservices Matter. One of the problems introduced by microservices is the large volume of services that must invoke other services in the system. Each of these services must know where to find the services it consumes, and attempting to manage the resulting configuration manually is intractable. To solve this problem Netflix created the Eureka server. A Eureka server is a service registry. It's like a phone book for your microservices. Each microservice registers itself with Eureka, and then consumers of that service will know how to find it. This is similar in spirit to a DNS service but with additional features such as host-side load-balancing and region-isolation. Eureka also keeps track of health, availability and other metadata about the service. That makes it an ideal place to start when building your own microservices architecture. Next, create a Heroku account, then download and install the Heroku toolbelt. The site will request a username and password. Enter "user" and the password you set for the EUREKA_USER_PASSWORD config variable. After you are logged in you will see the Eureka dashboard. It indicates that no instances are currently registered. A Eureka client is a service that registers itself with the Eureka server. A client typically provides meta-data about itself such as host and port, health indicator URL, and home page. It will also send heartbeat messages from each instance belonging to the service. If the heartbeat fails over a configurable timetable, the instance will be removed from the registry. After the build process finishes, you can view the application in a browser by running heroku open to confirm that it is running. Then view the logs by running the following command. This indicates that the client has registered with the Eureka server. You can confirm this result by refreshing the Eureka server dashboard. 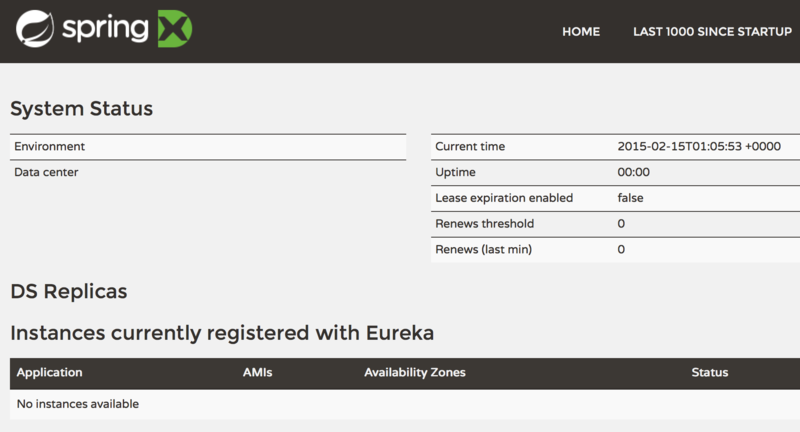 In the section titled "Instances currently registered with Eureka", you will see the MY-SERVICE instance. It's also possible to connect non-Spring clients by using Netflix's Eureka Client in it's raw form. Projects like Netflix's atlas and iep provide examples of using the client from Scala. The Eureka server does not have a persistent backing store. The registry is kept in memory because the service instances have to send heartbeats to keep their registrations up to date -- making it naturally resilient. Clients also have an in-memory cache of registrations, which keeps network traffic to a minimum, but also allows the system to continue working even if there is a failure or momentary outage for the Eureka server. Nonetheless, Eureka is a key part of a microservices architecture and redundancy is still important. 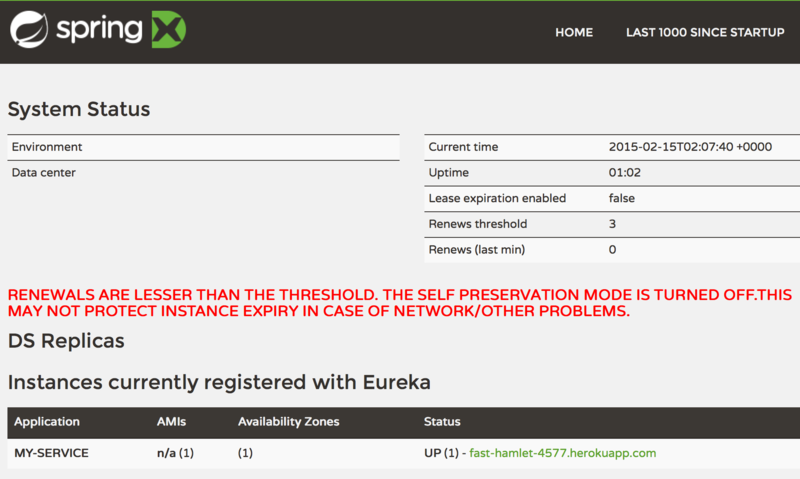 That's why Eureka can be configured to register and replicate with other peer instances of the server. Netflix recommends running each Eureka server instance in a different availability zone, but for this article we'll go one step further and demonstrate how to run each server in different regions. $ git commit -m "Added peer profile for replication"
Note that you are setting the EUREKA_PEER_URL on each app with the URL and credentials of the other app. After both deployments have completed, check the dashboard for each app. In the "DS Replicas" section you will see the opposing app listed. After a few moments, you will also see it listed under "available-replicas" in the "General Info" section (this means it has connected successfully). Now you can stand up additional replica nodes as necessary. Hysterix Clients: implements a circuit breaker pattern. Hysterix Dashboard: displays the health of each circuit breaker. Ribbon: a client side load balancer. Feign: a declarative web service client. The result is a powerful, production ready, microservices architecture with very little operational cost. For more information on Netflix open source software, see the Netflix OSS Homepage. For more information on Spring Cloud, see the Spring Cloud documentation. For further discussion on microservice architectures, see the recent post Why Microservices Matter on the Heroku blog.